One of the problems facing clinicians and epidemiologists today is the etiological role of certain Enterobacteriaceae in human pathology. During the last 30 years many species of uncertain pathogenicity for man have been described as, e.g. “coli-like” or “paracolon” bacteria, Escherichia freundii, E. intermedia or Paracolobactrum and Citrobacter. Like Salmonella, Escherichia and Shigella, all these bacteria have recently been biochemically, serologically and immunochemically defined and classified [1, 2, 5, 13, 18]. To clarify the etiological role of these bacteria is rather more difficult. Generally speaking, the evidence derived from animal experiments has no bearing on similar infections in man and such experimental results can only be seen as having an informative character. Thus we must rely upon representative compilations of scientifically evaluated ecological and epidemiological data, which are, however, not easily available at the present time. 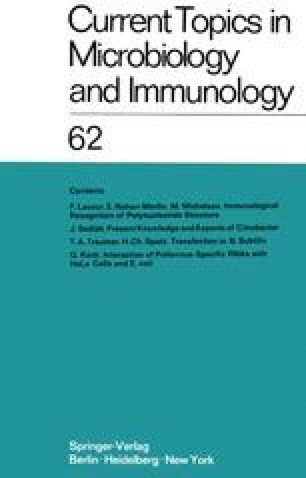 This paper reviews what is known about the bacteriology, ecology and immunochemistry on the basis of the available world literature and the author’s own work.